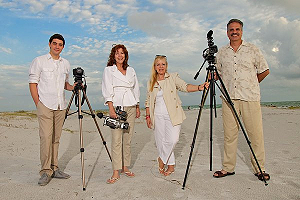 Anna Maria Island Beach sunset – Have fun after your wedding ceremony. Rainy Day Beach Wedding Video – Umbrella makes nice prop. The services of a wedding planner can be invaluable when it comes to your beach wedding. If you can, try to earmark part of your budget (about 10 percent of the total) for a planner. She can shoulder the burden of researching, auditioning, and securing local vendors — and this last tool is especially valuable if you require services specific to a destination wedding or an outdoor wedding, like tents & special food prep stations. A planner is also the behind-the-scene queen that can create gift bags for guests, greet everyone at the airport, keep people busy with fun activities and get everyone there on time. Local wedding planners will have props for your Florida theme and beach theme wedding. Remember, unlike a wedding in a hotel ballroom or restaurant, guests are dependent on you once they reach the destination. Make sure you have adequate signage on the beach to direct guests to the ceremony spot. If the beach has limited parking, consider providing a shuttle service from a central location. A trolley for guests and a limo for the bridal party may make several trips if needed. If you’ve decided to tackle planning on your own, be sure to scout out beaches after you’ve finalized your guest count. You’ll need to know if there’s a limit to how many people you can bring on the beach and how certain spots might affect your set-up. You’ll also want to decide whether you want to have your reception directly on the beach. If so, you’ll need to make catering arrangements for the wedding reception and find a rental company that can provide you with all the necessary equipment. Big tents are a way to prepare for any time of weather. Arrange for accommodations for guests at a great hotel on the Siesta Key beach. A good way to make nice with the local vendors is to send handwritten thank-you notes, with tips enclosed, when you book their services. (Remember that they can literally make or break your wedding, and a little goes a long way toward getting them on your side.) During the event itself, it’s wise to have plenty of small bills on hand for palm-greasing, especially for the delivery people who will be setting up your site to turn it into a wedding wonderland. Make sure to provide meals for your vendors at the reception. Usually your band or DJ will need to take a break, along with your photographer and videographers. Clue guests in to your wedding’s sandy locale when you send your save-the-dates so they know to dress appropriately (no stilettos!) Stockings and heels are perfect for indoor weddings but they are out of place and uncomfortable at beach weddings. Don’t be upset if some of your closest friends or relatives don’t attend. Some, like your great Uncle Charlie, may not be able to walk to your beach wedding or sit in the sun for an extended amount of time. And while your wedding is, in a sense, a mini-vacation for you, it may not be the one they want to take! On the other hand, you may be surprised how many people will want to attend your wedding when it is on a beautiful barrier island off the coast of Florida. Sunsets over the Gulf of Mexico are so worth the trip. Plan on a large turnout at your Sarasota wedding. Don’t forget to consider the climate when choosing your dress. You’ll be swimming in sweat if you pair your fairy-tale satin ball gown with the beach’s intense rays. Certain fabrics look better in the humid Florida climate. Go for lighter fabrics and silhouettes, and be sure to slather on the sunscreen or you’ll risk some serious burn. Go over these details with your make up artist. You want to look good for your beach wedding photos and video. Don’t keep a constant eye on the time. Remember that you can’t control the environment (really, you can’t) and you may need to wait for the tides to recede or for the beach to empty a bit before you can start the ceremony. Keep an open mind — and remember that minor mishaps can sometimes make for the best memories (really, they can). So be prepared. You chose a beach wedding because you love sunsets over the Gulf of Mexico, the crystal-clear water, the white sand and the dolphins – so make the most of it and enjoy the natural environment. Consult the Farmers Almanac and your photographer for beach portraits and sunset times. Schedule your wedding ceremony accordingly. My advice: Allow for an hour after the wedding ceremony for beach posing. You can pose for your beach wedding video during cocktail hour. I like to film video before and during sunset. The “afterglow” can provide the most dramatic and romantic video footage in your beach wedding video. Whatever you want to have with you for the ceremony (vase, candles, etc. ), you have to lug along to the destination (or ship it there ahead of time). Once there, make sure you can actually cart everything onto the beach with ease. My beach wedding advise is to use coolers on wheels. They keep unwanted beach sand out of precious wedding keepsakes. Be sure to place an amenities basket at the entrance to your spot on the beach that is full of essentials for the day outdoors (suntan lotion, water, etc.) and goodies that will remind them of the setting — embroidered beach blankets with your names and wedding date, shawls for the ladies, or pretty umbrellas in your beach wedding colors, for example. (Video loves color. If you want your video to pop, include lots of bright colors in your decorations and bride’s maid dresses.) His & her flip-flop are fun & useful party favors.